Before Ned Rorem, Charles Ives (1874-1954) was the most distinctive and important composer of art songs in America. This musical visionary continually broke with European models to create a highly personal form of musical expression. In nearly 200 songs, he set verses by poets ranging from Shakespeare, Goethe, Keats, and Byron to Whitman and Kipling, with many original texts as well. Some of his best-known songs include "Shall We Gather at the River," "The Cage," "General William Booth Enters into Heaven," and "The Side Show." 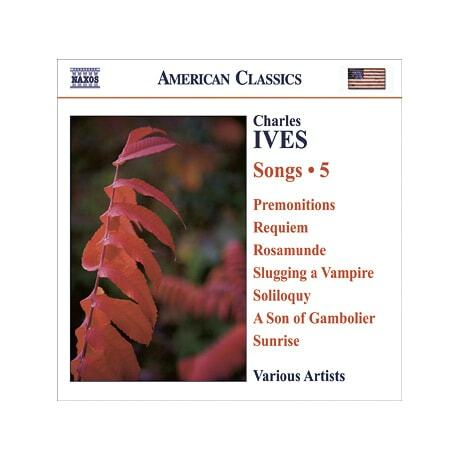 This set of 40, typically idiosyncratic Ives songs takes us alphabetically from "Paracelsus" (excerpted from Robert Browning's epic) through "A Sea Dirge" (set to Shakespeare) to "Swimmer" (lyrics by Louis Untermeyer). Highlights include mezzo Leah Wool's "Qu'il m'irait bien," tenor Kenneth Tarver's "Rosenzweige," countertenor Ian Howell's "Serenity," and bass David Pittsinger's "Slow March." Among the other selections are "Romanzo di Central Park," "Rock of Ages," "Slugging a Vampire," "The Side Show," and "The South Wind."